Improved Efficiency & Extended Life With Proper Routine Maintenance! To reduce the frequency of costly air conditioning repairs consider one of our routine maintenance plans. Air conditioning maintenance is the best way to keep your cooling system operating at peak efficiency and correct problems before they become costly emergencies. A neglected air conditioner costs you money in lost efficiency, unexpected breakdowns and shortened lifespan of your cooling system. The tech showed up on time. Clean cut and didn’t smell like a cigarette! He got right to work, pulled a lot of lint out of the vent tube. Performed an A/C service, found a wire that was loose wire that could have started a fire and cleaned out our drain line that was clogged, which prevented a future issue that we were not aware of. The previous owners did not do any preventative maintenance, my wife and I are very happy with the work performed and would highly recommend this company to our friends and family. Best money spent so far!! Best of all, an air conditioning tune up even pays for itself – a comprehensive air conditioning tune up can save you up to 30% on your energy bills. 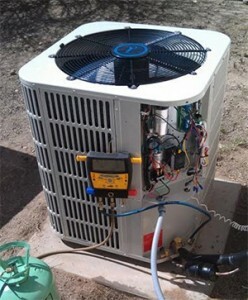 As technology has changed over the past decade, so has the complexity of air conditioning systems. Our At Your Service Air Conditioning & Heating, Inc. team continues to invest in ongoing training so our technicians can get hands on experience with new technology and keep their diagnostic skills honed. Our customers benefit by having technicians spend less time resolving their problems and by having it done correctly the first time. Being there when we say and providing honest fair work is a staple of our team. We look forward to serving the community for many years to come. When considering who to call for air conditioning repair & maintenance needs please consider AT Your Service Air Conditioning and Heating, Inc.
For the fastest service and response please call 239-565-9433. Receive energy efficient ideas to help you save money!